Here’s the RAW Version of my interview on the Organic Gardener Podcast with Gabe Siciliano from Abe’s Acres. For the most part. Sorry about the typing, I really notice it. I hadn’t figured out how to split the tracks yet recording with zoom this but I’m still having sound problems??? Episode 222? 240? STRANGE…. My property stretches across two counties. My great grandfather started acquiring land during the new deal. It’s 276 acres total. I am not growing on that much of it. I’m growing on about an acre. I ultimately want to grow on 9 acres in total cultivation, 6 of it would be in production on any given year I think that’s about the maximum a person can manage with about 5-6 employees and still maintain some sanity. If you’re doing mixed annual vegetables. We’ve been working on a garden book for years, but it takes a lot of time. I always tell people I don’t understand the blank page, why sit and stare at a white piece of paper because I always have a million projects. If I don’t have a vision for it or see it right then and then why push myself? Because at the right time I’m gonna hear it and I will know the whole thing and we just banged it out over Christmas break, we only got through lessons 1-6 and the others will come out in June. I actually bought the domain names last summer and then just one day driving home from school I couldn’t stop I could just hear the lessons and the table of contents it just started pouring out of me! I’m a bit out of funk with my podcast, cause I teach full time, don’t hesitate to put me on hold. Do you have any questions? Do you listen to podcasts? I listen to tons of podcasts! When I’m working. Especially when it was just me! Even before that I was working at different apprenticeships. Listening to podcasts like after working on 6 acres of carrots. Farmer to Farmer one of the growers I was apprenticed to was on there. I’m never gonna run out of podcasts… Im proud or maybe ashamed to admit I finished Radiolab this summer. But this is the first one I’ve been in which is interesting cause I spend about 10 years a day listening to podcasts. Well next year you’ll have your own and you sound like you’ve had a lot of things to share! You sound like you are. Farmer to Farmer with Chris Blanchard. Welcome to the Organic Gardener Podcast today Gabe Sciliano from Abe’s Acres! It’s Monday February 12th. It’s a chilly day outside my window, it says it’s -19º outside my window. I have someone from NJ, Gabe Siciliano, he’s a fellow podcast listener and it sounds like he has an amazing story to tell us so Welcome Gabe! had a decent go, not as successful as he would have liked so since I got into farming I decided to name my farm after him to keep that dream alive! Sounds like you’re another Rockstar Millennial amazing 26 you have 6 employees and running this place by yourself? No, no, no. That’s my ultimate goal! This was my first season! Last year it was just me on an acre! A lot of tasks that go 4 times as long if you only have one pair of hands. So I found out about Abe because I just put up my episode I did with Tom Natan and he was in NJ and stopped in a restaurant and bought produce from your little stand? Tell me about your first gardening experience. Did you grow up in NJ? My grandfateher Joe in his semi-retirement he was always in the yard working on this. 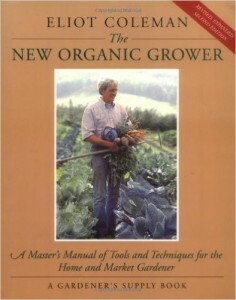 Did he grow organically is that how you learned. learned my craft and what it takes to grow on a production scale using organic methods which is a lot harder then the equivalent of conventional growing. Dd you learn some tips or tricks? My husband dug up this area I call the mini farm his goal has been to grow all our food, I can’t even imagine what he grew this year was huge I can’t even imagine how people get to that production point. there was a lot there! Because once the temps go above 95º or so the peppers start dropping flowers without making fruit. that’s why colored peppers cost more, they’re on the plants longer and requiree more field care. Can I ask a quesiton? Do they call them that because they’re brown or do they have a chocolate flavor? They have a very chocolately color. They’re delicious! They’re not an incredibly high yielding plant. It’s a really early variety of pepper. It’s one of those things that looks a little bit different so it might not be super popular at farmer’s market. People wonder what does that taste like? But they’re very sweet! Tell me about something you are excited to try new or different next year! I’m gonna be doing a lot more root crops for winter storage. In particular I’m gonna try bunch of carrots to see what grows well in my soil. That’s one way market farmers can extend their profits through the off season by storing veggies. Things that can be stored in cold storage and sold throughout the winter. Keeps you in touch with your customer base and keep some income flowing. I had hoped this season to put up a high tunnel but Idk if that’s in the cards then I could have grown greens throughout the winter. Where do you market? Where are you gonna sell carrots in the winter? Do you have a CSA or a grocery store? How would you supply your customers in the winter. This year I primarily worked with restaurants. It was easier to make my budget work if I knew exactly how much I’d be selling. So I worked out ahead of time how much I’d be selling and I had at one of the restaurants a market stand. How often did you go there? Once a week? I also sold some produce to a local health food store one town over. In the future I’d like to do more farmer’s markets and less work with restaurants. Maybe work with one or two restaurants growing specialty crops because I enjoy doing that. My bread and butter is working at farmer’s markets. I love growing the food myself and talking about the product! Talking about what it takes to grow something. A lot of people are divorced from food production. Don’t understand what it takes to get it to the store shelves and that it takes to grow food human hands. Applying to get into 2 markets a week and keep working with a couple of the restaurants. So much there! Was it from doing your apprenticeships that made you reach out to restaurants. How do those questions go but I think I would be nervous going to a chef. Those conversations usually go something like. What do they use. How much do they use. In the height of summer a restaurant is going to be using a bunch of tomatoes but not a ton of basil. Some places are interested in basic crops and others are going to be interested in specialty crops. There’s a green called mache that has a buttery silky texture. It’s hard to find because it’s not as popular in the US as it is in Europe. What they need and how much to plant and expected yields. I ate that in Paris. It’s in those mixes more and more. Is it hard to grow? It was a challenge there was not a lot of information in English and not on any kind of production scale. It’s a book end crop, grows better in the fall then the spring. That was the success. It likes the cool. Only get one or two crops out of it, management of successions is crucial. got any tips for managing successions? I feel like I need to take the seed packet and say I’m gonna plant these on this day and these on this day, not go outside with the whole packet because it ends up in the ground. I’d be getting a beets once every month or so once the season starts. It might be hard in the beginning but once you have it it’s great to have that document. Working from a template is very very good! That’s interesting because we came up with our first book, it’s called the 2018 Garden Journal and Data Keeper and it’s all based on that keeping track of things I need more planning and things. We came up with the 2018 Garden Goals Challenge. People were really downloading that so I think they will love this! I would say the thing there’s always a lot of stuff that doesn’t go the way you want it to. The biggest problem was how wet and cold of a spring we had. It snowed before I was gonna do my primary tilling. The first year I’m sure you know the worst thing you can do is till when it’s wet and cold. It stayed cold and wet into April. Do to the fact it was just me trying to get all the prep done when it was April I missed some early successions and that sort of tripped me up for the rest of the year. This year if my schedule says get out there if I have to stay out for 14 hours I’m gonna stay on schedule. Or you might have to get some help because that sounds a little tough. Have you thought about getting an intern? or a woofer? Because it sounds like you have a lot of experience. I have reached out to the local high school ag program because I can’t pay anyone right now. That would make things so much easier for me, hand-weeding is a long chore. I have also talked to some people about a business partner sharing the equity. It’s really a lot to handle one other pair of hands would make things go so much faster. To me one of the hardest parts is balancing between being a farmers and doing all the work on the farm and then being the sales person and going to market? I spent a lot of time making deliveries and then there was no one in the field and I’d have to make a choice between ok, do I make these deliveries or do I let some field work slide for a couple of days. having another set of hands, someone else to work with would make those decisions easier. Definitely somethings I had a lot of trouble with this past season. Do you do a lot of reaching out at this time of year? This is the time of year where I’m sitting down with chefs and asking How much they’ll need? When they’ll need it? This goes back to planning. Really good effective planning ahead of time. These are the conversations that are difficult have time during the season. You don’t want to just jump in and be like I have these 100 lbs of extra tomatoes I have. It really helps for planning. Can I ask a questions about, I brought some herbs into a restaurant I was working at and they were like we’re not gonna use them because I’m not an official farm. No, IDK if it’s different in your state. You could probably get an official certificate from your extension. If you have something a chef wants they’re really excited about it. I know a lot of people that go out and forage wild mushrooms. Chicken of the woods chefs will say sure I can’t get this anywhere else. As long as they don’t have any questions about cleanliness… or safety. Weeding carrot seedlings when they just germinated! It’s tedious! It’s exacting! and if there is a lot of grass in your bed it’s easy to confuse them because when carrot seeds germinate they don’t have their leaves yet they look just like grass. When I went to the seed fair they were spacing the seeds on newspaper like seed tape. That would be cool, there’s something called paper pot transplants. They have these strips you plant along the row. Unfortunately it’s not certified for organic use yet. Most growers will use a seeding machine but you still have to hand-weed once the seeds have germinated. Because carrots take so long to germinate the weeds have grown faster and you have to stay on top of it until the carrots get tall enough. Carrots are tough I like to get the grandkids out with their small hands but we’re not a big operation or anything. havesting in general. Garlic scapes is very satisfying. If you pull it properly it makes an exciting popping noise! you see them on the menu these days! My favorite way to prepare them is grill them with olive oil and pepper they’re only around for a few weeks in June! Take meticulous records. You think you’re not gonna forget but you will! I coudln’t tell you what I was doing on July 15th if I didn’t have a notebook to look back to! Where do you keep track? Online, a physical notebook? Most farmers I know use excel and for crop data they have a notebook and field log to keep track of daily tasks. AgSquared has a yearly subscription. 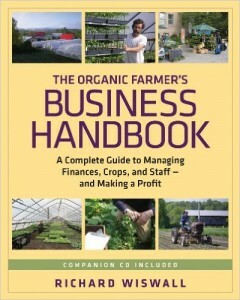 have you read Richard Wiswall’s Organic Business Handbook? I think he has those charts and cds etc. How about a favorite tool that you like to use? If you had to move and could only take one tool with you what would it be? The Dewitt Diamond Hoe with a pistol grip. You can move it in any direction and it will cultivate and it has this grip to help you get roots. Hand hoeing for 6-7 hours a day having the proper tool really matters. It’s not cheap but really useful. What’s your favorite recipe you like to cook from the garden? Garlic Scapes? Probably my favorite! Grilling fresh vegetables is what I do throughout the season. You can gril anything eggplant, tomatoes, onions it all works! Do you have a favorite reading material-book, mag, blog/website etc you can recommend? I just can’t ever imagine us having enough water. We dug a deep well a few years ago and we still ran out of water almost every other week last summer! I love that you apprenticed places. Did you always know you wanted to do this? No, I didn’t know until a few years ago. If you are really interested in going into business learn the business from the inside out. Learning by doing has always been the best for me. I know a couple of people that just read everything they could get their hands on and started a farm but if you really want to know if it’s something you can do in terms of the amount of work and time you need to spend to make it profitable. IT really helps to see what it’s like to experience the business even if you just go to the farmer’s market for someone. When I interviewed JM Fortier I thought I would never have the energy to do all that they do, but then when I look at what we do teaching… but if you love it! Unless you have a way to partner up with someone. Exactly that’s why you need to learn about what those things are, better when it’s not your money and livelihood on the line and learn what you are good at. And what you want to do. And where you live is gonna make a difference. We were looking like 2 weeks ago you thought you could start planting and then we have 16º today. If I have a basil plant out I think it could die any day in the year in Montana. Access to good food and food justice. Depressingly overwhelming part of the population do not have access to healthy foods. In a lot of cities there are food deserts where all you have is access to fast food etc. Food corps are a subset of Americorps who work to educate people in inner cities and schools about where their food comes from what it takes to eat a healthy diet food justice is not only an ethical moral responsibility it’s better for the public good. It also nourishes it’s brains. Mike laughed at me buying fruit loops for my students but I’m like that bag of broccoli costs $3.00 and they keep asking when is Mr. Beyer gonna have purple beans again? The fruit loops are gonna last all week for $2.00. That’s a serious problem in our country. I do, my grandfather wrote this in his memoirs! When you become occupied in your garden with head in hands your worries tend to disappear. I often find myself unable to recollect what was troubling me before I became engrossed in thought or labor or pleasure in one of my gardens. Further one develops the self discipline that comes with having to do things when it’s time to do them. Planting can’t be put off. Neither can cultivating or weeding. You learn to keep going when you’d rather not. And to accept a poor result at the end of the season despite your efforts. you also learn to take justifiable pride when you walk around and see the ripening of your vegetables and the beauty of your flower beds. He was a professor of psychology at Princeton University. He wrote them fro his grandchildren. He had them printed and bound for us. Joseph Notterman. Download the first 30 days here while you’re waiting for it to come in the mail.